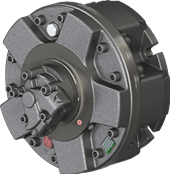 Dual Displacement motors are able to offer High Torque and High Speed performance with a more effective and efficient use of the power available. 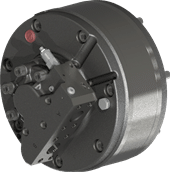 They are available in five cylinder BD format and seven cylinder TD format covering a wide range of displacements. Change of displacement can be made hydraulically or electronically and can be done with the motor stationary or in motion. The ratio of displacements can be 2:1, 3:1, 4:1 or even 1:0. 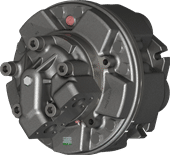 Due to the variation of displacement being by altering the crankshaft stroke the motor retains it’s high efficiecy even in low displacement mode. 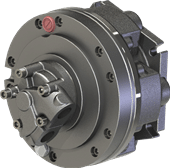 SAI BD Motors have five cylinders with a minimum and maximum displacement giving good high torque and high speed performance. The displacement is changed by altering the stroke of the crankshaft which enables high efficiency to be maintained in both modes. 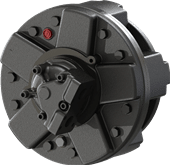 SAI TD Motors have seven cylinders with a minimum and maximum displacement giving good high torque and high speed and high power performance. 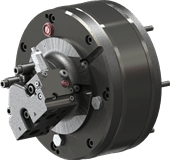 The displacement is changed by altering the stroke of the crankshaft which enables high efficiency to be maintained in both modes.It is possible to have minimum displacement of zero in SAI TD Motors.